Different Is the New Normal follows the adolescence of Ariel Small, whose family learned he has Tourette syndrome when he was five years old –- noticing his unique motor tics such as blinking. His parents, Robin and David Small, who produced and provided major support for the documentary, struggle to help Ariel fit in at school and at home with his four brothers in the Chicago suburbs where they live. Through vintage home videos and one-on-one interviews between Ariel and his mother, we learn that Ariel is an intelligent, thoughtful 17-year old young man who has a gift for articulating the complexities of Tourette’s and how it disrupts his daily functions. We learn that most people who have the disease exhibit both external symptoms like tics and internal behaviors like obsessive-compulsive disorder, attention deficit hyperactivity disorder or learning disabilities. As Ariel talks about his middle and high school years, it’s clear that kids’ taunting, teachers’ misconceptions of the disease and the insecurities that kids with Tourette’s must deal with can set the stage for emotional chaos. We learn that some teachers at Ariel’s school don’t believe Tourette’s is an excuse for what is seen as disruptive classroom behavior. Ariel seemingly overcomes these issues, gets good grades, and even wins the class presidency. This triumph comes tumbling down, however, when he assaults his gym teacher, is suspended for three days from school, and the school principal, who tells Ariel he doesn’t believe he has Tourette’s, takes the presidency away from him. I would have liked to have seen more of Ariel’s life in action; to watch him navigate through these pivotal life lessons and show us how Tourette’s can be a truly disruptive force that goes beyond facial tics. Instead, he shares these stories on camera years later, with the benefit of 20/20 hindsight and a dose of maturity. 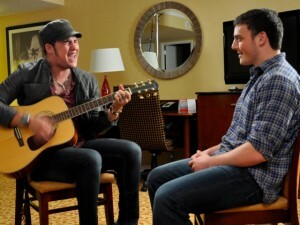 One highlight of the film is Ariel’s meeting with James Durbin, the American Idol contestant who wowed audiences with his outsized personality and emotional renditions of heavy metal ballads. Durbin speaks about his own battle with Tourette’s, telling Ariel that he quit school after bullying by other children became too much to bear. It doesn’t seem that Ariel suffers much in the way of teen taunting, which is partly helped by his scholarly and athletic pursuits, and the medicine he takes to reduce his motor tics. This is the case for many kids who take prescribed pills to calm their symptoms and help them feel more “normal”. Another documentary by HBO and the Tourette Syndrome Association talks more about the use of medicine to control Tourette’s. I Have Tourette’s But Tourette’s Doesn’t Have Me turns the camera on a group of kids ages 8 to 13 who have the disorder; we see the range of motor and verbal tics that the condition inflicts: blinking, jumping out of chairs, head-shaking, squirming, involuntary outbursts of words. Taking us into the eye of Tourette’s reveals the real emotional vulnerability of those affected by it. At such young ages, hearing them talk about how they try to hide from their teachers and friends what they consider to be abnormalities is heartbreaking. The film’s goal is to teach acceptance, and hopefully curb the bullying in schools nationwide that often happens to kids who have Tourette’s. Meanwhile Ariel is doing well. He has sought out other kids with Tourette’s and is now a youth ambassador for the Tourette Syndrome Association. The movie gives you the sense that he’s working towards college and a career in politics, and will have the support of a loving family who sticks by him. As Ariel grows older, he is learning – like other teenagers – that he has to navigate on the world’s terms, not just his own – a lesson his parents have rightfully taught him. He now knows the best way to help himself is to advocate and educate about Tourette’s while keeping focused on his goals. Ariel is doing a great job at both ends, and it’s easy to see why he was chosen to represent the 200,000 people in the U.S. who have Tourette’s and would like more exposure for what they must endure each day. Different Is the New Normal will again on September 27 at 10:30 pm ET on WLIW21. What an inspiring story. Thanks so much for sharing!